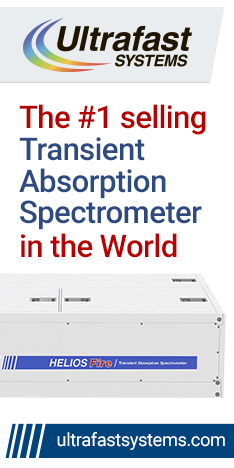 The RP Photonics Buyer's Guide contains 14 suppliers for Fabry–Perot interferometers. Ask RP Photonics about the optimum design for a Fabry–Pérot resonator, for calculations of its properties, its optimum use, etc. A Fabry–Pérot interferometer (also called Fabry–Pérot resonator) is a linear optical resonator (or cavity) which consists of two highly reflecting mirrors (with some small transmissivity) and is often used as a high-resolution optical spectrometer. One exploits the fact that the transmission through such a resonator exhibits sharp resonances and is very small between those. The spelling Fabry–Perot (without accent) is also frequently seen. Alfred Perot spelled his name with the accent, but the French civil register didn't. 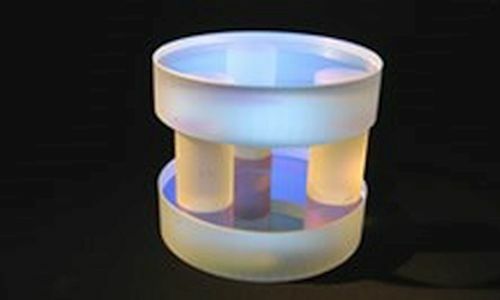 Strictly, a Fabry–Pérot interferometer by definition consists of two planar mirrors, but the term is frequently also used for resonators with curved mirrors. From a theoretical viewpoint, plane–plane optical resonators are special in the sense that their resonator modes extend up to the edges of the mirrors and experience some diffraction losses. However, Fabry–Pérot interferometers are usually used with input beams of much smaller diameter, which are actually not really matched to the resonator modes. For the usually small mirror spacings, where diffraction within a round trip is weak, this deviation is not very important. Normally, Fabry–Pérot interferometers are devices with free-space light propagation between the mirrors. However, the term is sometimes also used for devices containing in a waveguide. For example, Fabry–Pérot lasers are laser diodes containing an active (amplifying) waveguide with some kind of mirrors at the ends. For optical spectrum analysis, the Fabry–Pérot interferometer is often made short enough to achieve a sufficiently large free spectral range; the bandwidth of the resonances is then the free spectral range divided by the finesse. Due to the high reflectivities, the finesse can be high (well above 1000, and with supermirrors even much higher). 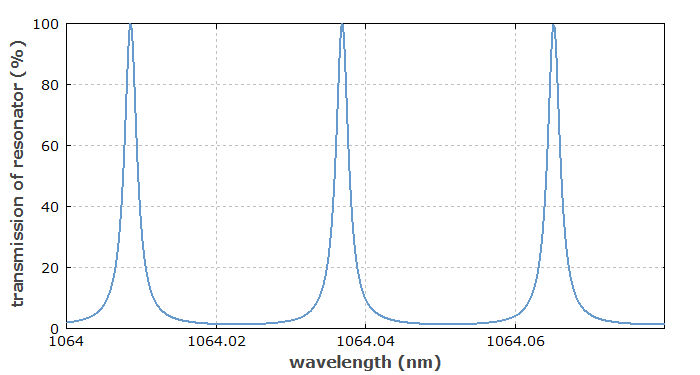 For a given finesse, the wavelength resolution can be improved by increasing the mirror distance, but only at the cost of reducing the free spectral range, i.e., the range within which unique spectral assignment is possible. Figure 2: Frequency-dependent transmission of a linear Fabry–Pérot cavity with mirror reflectivities of 90%. The resonance frequencies can often be tuned by changing the cavity length (mirror distance) with a piezo actuator. When the voltage applied to the piezo is periodically varied, e.g. with a triangular temporal shape, and the transmitted power versus time is monitored with a photodetector and an oscilloscope, the latter can directly display the optical spectrum of the incident light, provided that the spectral width is smaller than the free spectral range and the scan is slow enough to reach a quasi-stationary state of the resonator. Figure 3: Animated graphs, showing the reflected and transmitted complex amplitudes and the power transmission while the round-trip phase shift is varied. Both mirrors are assumed to have a reflectivity of 80%. In this symmetric situation, total transmission and zero reflection are obtained in resonance. Figure 4: Same as above, but with mirror reflectivities of 80% and 50%. In this asymmetric situation, the reflection does no more go to zero in resonance. A typical application of a Fabry–Pérot interferometer is to check whether a laser operates on a single resonator mode or on multiple modes. High-finesse Fabry–Pérot interferometers are also used as reference cavities. A variant of the Fabry–Pérot interferometer is the Gires–Tournois interferometer. This is used not for spectral analysis, but for generating chromatic dispersion. LightMachinery manufactures the world's finest solid and air spaced etalons. Our fluid jet polishing systems allow us to routinely create surfaces that are better than λ/100 peak to valley. Solid etalons, air spaced etalons, piezo tunable etalons, Gires–Tournois etalons – LightMachinery has extensive expertise in the manufacturing and testing of all kinds of Fabry–Pérot etalons from 1 mm square to 100 mm in diameter. These devices require high quality, very flat optical surfaces and extreme parallelism to achieve high performance, making them a good match for the polishing and metrology at LightMachinery. The FPI 100 is a confocal, scanning Fabry–Perot interferometer with a built-in photodetector unit, designed for measuring and controlling the mode profiles of continuous wave (cw) lasers. The FPI is available with different mirror sets and photodetectors for wavelength ranges between 330 nm and 3000 nm.